LET'S EAT! The average person in much of Asia eats rice two or three times a day. THAT'S A LOT OF RICE. The average person in Myanmar eats 195 kg of rice each year; in Lao PDR and Cambodia, it's about 160 kg. Contrast this with the average European, who consumes 3 kg per year and the average American, who eats 7 kg. MUD, SWEAT, AND GAZING AT A WATER BUFFALO'S REAR END. 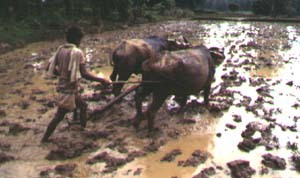 To plow 1 ha of rice land in the traditional way, a farmer and his water buffalo (preparing land is almost always men's work) must walk 80 km. WHAT? WILD RICE ISN'T RICE? The so-called "wild rice" in North America isn't rice at all—it's actually a grass in a different genus. GROW IT, EAT IT. Most rice is consumed in the country where it is produced. Only 5 percent of the world's total is exported. Thailand ships the most: about 5 million tons a year. The United States is second with nearly 3 million tons, and Vietnam third, with 2 million tons. THIRSTY RICE. It takes 5,000 liters of water to produce one kilogram of rice. WHY IS MY BACK SORE? In Asia, planting rice is often a back-breaking chore. Every seedling must be poked into the mud by hand—usually by women. HIGH-TECH RICE PRODUCTION. Many rice farmers in the United States level their fields with laser-controlled earthmovers and seed their fields from airplanes. THAT'S DIVERSITY! More than 140,000 varieties of cultivated rice (the grass species Oryza sativa) are thought to exist—but no one really knows for sure. More than 90,000 samples of cultivated rice and wild species are stored in trust in the International Rice Genebank for use by researchers around the world. RICE-EATING COUNTRIES. Three of the world's four most populous nations are rice-based societies—China, India, and Indonesia. Together, they have nearly 2.5 billion people. 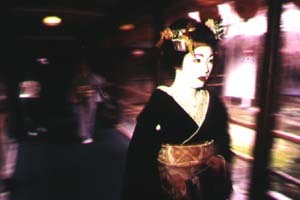 People in Asia use nearly every bit of the rice plant for something. MUD, SWEAT, AND GAZING AT A WATER BUFFALO'S REAR END.